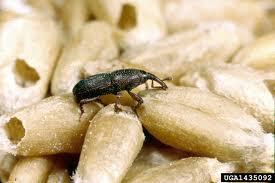 What do you do when you find weevils in your grains? Weevils can be handled in one of several ways. If it is just a few, they are just extra protein. I have eaten them on many occasions and so have you. They are in many commercially processed foods. The FDA even has an allowance for how many insects parts can be allowed in foods. As I said if it is just a few, I am going to cook and eat them. If there are more or you can’t tolerate the thought of consuming them. There are a couple of other solutions. Weevils tend to float, so simply fill the grain pan with water and wait for them to float to the surface. Do this a couple of times and most of the weevils will be gone. My personal favorite is to spread the grain out in the sun, no more than ½ inch deep. Stir it a couple of times to make sure they are all exposed. The weevils don’t like the sun and will leave on their own. If you still have power you can place the grain in the freezer. This will kill them. If you pack grain with weevils in it using can or Mylar bags with oxygen absorbers, the lack of oxygen will kill the weevils. Just remember eating weevils won’t hurt you. Add to Your Storage by Canning Food Now! This entry was posted in food storage and tagged grain, Howard, weevils. Bookmark the permalink. I’ve eaten weavils in grain and rice with no issues. Serving overseas with other countries sometimes controlling the food supplies you take what you can get. Bugs aren’t kosher. Just food for thought. We float them to the surface of the water, then scoop them up with a very fine strainer. Never pour the water out as you will lose the vitamins that were sprayed on the rice. We store our grains with a healthy dose of Food Grade Diatomaceous Earth mixed in. It kills the insects and is good for you to eat. Can purchase from Amazon and several other places. Even thought the extra protein may be missed from the weevils, you are not eating their droppings! Probably the chickens would like the weevils (or the grain itself if you aren’t gonna eat it because of the bugs). When I find weevils in my grain, I freak out and end up throwing stuff all around the kitchen. This approach seems to work really well for me. What about the nutrition value of wheat when it has weevil?